These bars have a crunchy shortbread crust, a tart lime curd filling, and a crunchy coconut topping. This is also my submission for this months "Go Ahead Honey It's Gluten-Free". I'm the host for July and the theme is "Raising the Bar - Grain-Free and Refined Sugar-Free Bars". So check back here at the end of the month for more great bar recipes, and submit a recipe of your own. Preheat oven to 350 degrees. Butter or grease a 7" x 11" baking dish (I used a Pyrex dish). For the Shortbread Crust: In a large mixing bowl, combine the almond flour and the coconut. Mix honey into melted butter and then pour into flour mixture. Stir until combined. Press into prepared pan and bake for 15 minutes. Remove from oven. For the Lime Curd Filling: In a medium saucepan, whisk together filling ingredients. Then place over a medium heat and stir constantly until mixture thickens and coats the spoon. Do not overcook. Remove pan from heat. For the Topping: Combine the coconut and almond flour in a large mixing bowl. Stir honey into melted butter to mix. Pour into flour mixture and stir until combined. Pour lime curd filling over the crust. 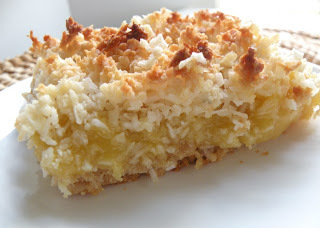 Then evenly sprinkle coconut topping over it. Bake about 15 minutes. Cool before serving. I am low carb and sugar free so was wondering if I could use a sugar sub for the honey in this recipe?